Quickly repair & recover the corrupt SQL Server MDF database. Export MDF/NDF file into SQL Server database or as SQL Server compatible scripts. SQL MDF recovery software recovers all components of SQL database (tables, stored procedures, triggers, views etc.). The tool owns the potential of retrieving data from MDF and NDF file that is corrupt. There is a situation in which SQL tables' records can be deleted either accidently or unknowingly. At this stage, SQL database recovery tool helps the user to recover deleted records from the table without any loss of data. 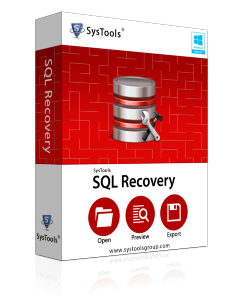 SQL recovery software recovers both primary and foreign key. After the DB is restored to SQL Server, the users will have database with their keys available. This will retain the relationship between the tables. Once the MDF and NDF files are scanned by SQL MDF recovery tool, the software gives option to save the scanned results into .str file. This will save scanning time for next phase of review by loading the .str file. After scanning, SQL database recovery tool provides the option of having a view over the components of the SQL database. All database items can be viewed within the built-in previewer of the tool. The database held in the form of MDF or NDF file can be attached to SQL Server for review. The software gives facility to directly export database into live Server without or without schema. If a known part of the database has to be scanned, then a section can be exported to SQL Server. This facility can be availed by enabling the check box for folders and objects. If columns or variables are of XML type, then also its recovery is supported by the tool. Moreover, XML documents that are stored on SQL Server can be recovered. How can I add the STR file in the tool? In the menu bar, there is an option "Load" included in the tool. Click on the button and select the STR file that has scanned data of MDF and NDF file. We have SQL database in suspect mode. Will the software work? Yes, the software is capable of recovering data even if the DB is in suspect mode. Even, if the database file is corrupt, the software will recover data from it successfully. Does this software recover database for SQL Server 2012? Yes, this tool works on databases of all SQL Server editions. So, if you have database for SQL 2012 edition, the software will work. Do I need to have SQL Server environment for recovery? No, for recovering data from SQL database file, there is no need of having SQL Server on machine. But for exporting the database, live SQL Server environment is necessary. This SQL database recovery tool has been an incredible support in forensically examining the database. Its DB previewing facility, creating script file, deleted records recovery are a huge help in analysis and examination phase." The biggest challenge for us is to attach the seized database to our available environment. The exporting MDF and NDF to live SQL Server feature of SQL recovery tool works for us and gives a way to simplify database opening."